So, that happened. Hurricane Erick, downgraded to a Tropical Storm. It was wet when we got up for breakfast, but not too bad. The walkways here are slick as snot when wet, my Luna Sandals had no problem (Vibram soles) but the girls were skating most of the way to breakfast. We had just a few minutes to eat before we needed to catch our tour. We were supposed to have a tour of some smaller towns today, but were unsure if the rain would have any impact. It wasn’t raining at them moment, but things were still pretty soaked. We were given a table on the porch, even though the buffet had been moved inside, there were still a few tables outside. We grabbed a quick few plates of food, then sat down t eat. There were just a few drops of rain coming down. Then a few more. And some wind. Within a few minutes it was pouring down, with wind whipping water all over the porch. We signed out tab and headed to the Lobby. It was too wet to walk by the pool, so we wove our way along the hallways, sliding along the tiles, until we got to the lobby. Yulia checked with the concierge, and our tour was waiting at the entrance to the other resort. Once he headed over to the right entrance, our tour guide confirmed that our tour was still on. Apparently, they normally didn’t run tours on Monday anymore, but our booking agent had an old brochure. some stuff might be closed. We figured that with pretty much everything closed at the resort, we might as well head out and give it a shot. We loaded into the van, and headed into town, back towards the airport. The rain was still coming down like crazy, and the roads were crazy. Think Seattle drivers can’t drive in snow? Try watching Mexican drivers drive in the rain. The standing water on the road was everywhere. the center of town looked like the “Mexican Flood” effect at Universal Studios, with water rushing out of back streets across the road. no one slowed down, they just hit their hazard lights before driving through a foot of water at full speed. We would get hit with sheets of water across the windshield, blinding us, and when it cleared we would be 1 foot away from a tanker semi filled with something Peligoroso. But all said, it was still easier than driving in Paris. After a pit stop at Starbucks for coffee, we headed out of town. The rain got a bit easier as we made our way up the Sea of Cortez side of the peninsula. There was still standing water everywhere, but the dounpours came in squalls that moved quickly overhead, and he wind was mild. Our first stop was Miraflores, where we say a local furniture workshop, and a leather tannery. The artist at the workshop was out, but his kids let us in to tour and see his work. He made rough-hewn furniture out of desert salvage wood, and it was pretty impressive. The girls followed around their home and dad’s shop, looking at us like we were the strangest thing they had seen, which may have been true. The wood was amazing, a beautiful deep grained wood with a golden-reddish color. Some really fantastic pieces. Our guide mentioned that we could always get a chair, and we noted that a chair might be difficult to pack. The leather tannery was working, we could tell by the smell. We were shown the whole process of soaking, scraping, and dying the leather. It was a open-air building, so the chemical smell wasn’t too bad. Local boys ran inside as we were there to swing on a rope hanging from the rafters. One dropped his shoe into one of the active pits, then jumped right in to pull it out, shook off the chemicals, and went back to the swing. He still had feet, so it must not have been one of the more active stages. But he was dripping with something. The owner showed us some of the finishing and tooling that he did, including a few chairs that he was repairing with leather seats. Our guide mentioned that we also could get a chair, and we noted that we still didn’t have that much space in our luggage. We went further north, with a driving tour of Santiago, which had a beautiful Mission and Plaza, big Mango and Avocado orchards, and a Zoo. The zoo was closed, but we could see Emus through the fence. That was fine with me because the rest of the place was just filed with animals, and I had no room in my luggage for any. Further up the road we stopped on the Tropic of Cancer. The weather cleared up a bit and we got out. There was a fairly impressive Highway rest stop with a marker showing the line where the Parallel ran, along with a small Catholic Prayer alcove, and a small plaza with shops that had examples of art from the local town. These were all closed of course, but it looked cool through the window. The rain hit again and we headed out. We had lunch at the seaside resort of Buena Vista, which was built over hot springs, and apparently was originally the home of some famous General. This was a big fishing destination and Spa, and we headed inside for a few beers and food. Probably the most fascinating aspect of this resort, unintentionally, was the Gringos. This resort was time-locked in the late 60’s, and filled with fat American guys there to fish and live cheaply. The place was amazing, it was like going back in time. This place couldn’t have changed a bit from the day it opened. The guys were that semi-familiar rude to the staff, with that leathery tan from being our in the sun way too long for a white guy. They gave Yulia a good looking over when she walked past the pool, then waved for more beers. The food was quite good there, Yulia had Sea Bass, Sasha had Chicken Fajitas, and I had Beef Tacos. It was all made local, and went well with Pacifico Light. A few strong rain showers hit while we ate, and the humidity shot right up. It was good to get back in the van to some AC as we drove back. The rain let up for the ride back, and the view of the desert was really great. I love cactuses, with the variety and alien nature. you could see how the rain had carved out the sand along the road, which wouldn’t last long, once things dried out wind would take away all the sharp edges and give back the smooth desert look again. We made a final stop in San Jose. This wasn’t on our tour, but our guide took us here to see the old town since we had some extra time (with the zoo and everything being closed). The old town was very cool. This would be well worth a full day on it’s own. The shops, art galleries, restaurants were all really impressive, and they apparently do a Thursday art walk. We hit a small jewelry shop, the church, and a Tequila tasting. We were tired and didn’t take too much time, but now we have a new location for our next trip down. As we drove back into Cabo, the rain and wind got stronger. We entered the resort and found that all but two restaurants were shut down. Our elevator was closed off (to save power) and the wind was still fairly nasty. 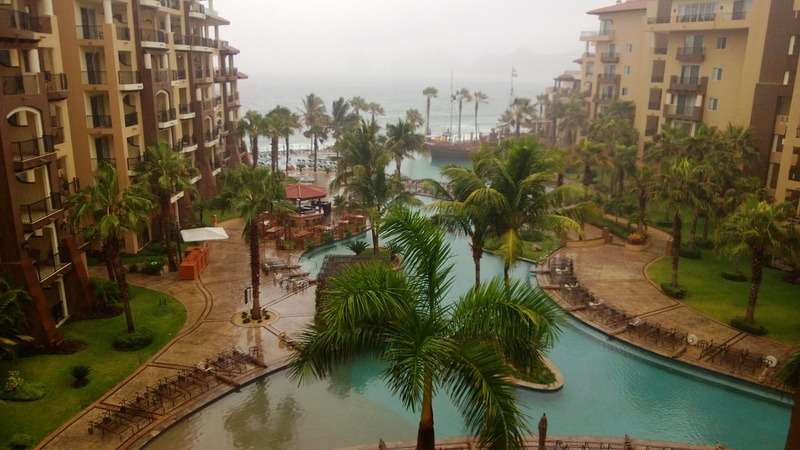 As strange as our day had been, the storm had hit Cabo pretty much all day. Lots of folks were getting stir-crazy, and room service for food was 3 hours behind. We managed to get in to a buffet to sneak some food, and things started clearing after dinner. We looked out to the beach, and found that the sand had changed completely. What was a fairly sharp drop off of sand in front of our place was now a long, smooth sandy beach. Further down we could see hotels that didn’t have much beach left at all. The shallows behind the hotel looked like a wetlands. We could hear birds hiding in the potted plants around the resort refusing to come out and screaming at each other. The next morning, it was bright and sunny. Welcome to Mexico. Only two restaurants! The Humanity! you learn to adapt and survive.